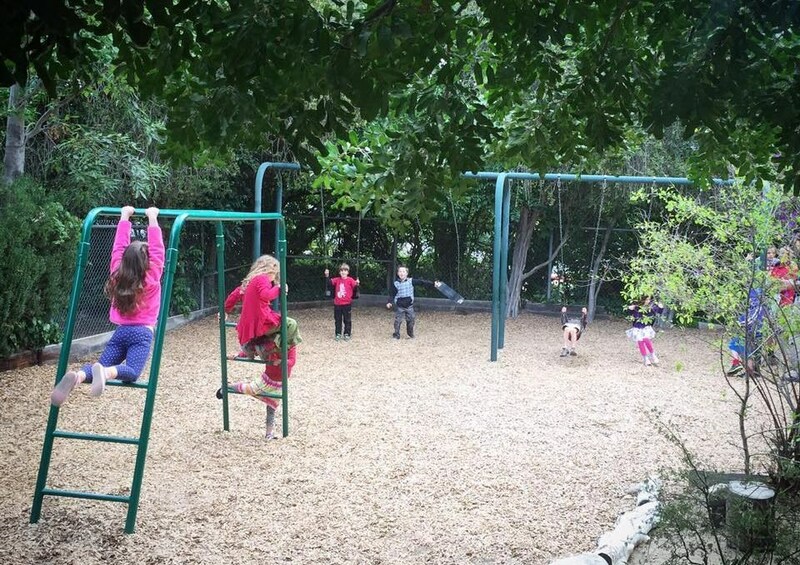 At outdoor playtime the children are given ample opportunities to run, climb, dig in the sand and the earth, haul wheelbarrows, jump rope, play on the swings and play structures, slide, look for bugs and blossoms, and engage in imaginative play. The children are free to help with gardening projects, water the plants, sweep the patios, and take weekly nature walks on campus. The landscaping of the yard has been consciously designed to include such things as hills to roll down, boulders to climb, and logs to carry and build with, all of which greatly supports and enhances the variety of the children's movements as they work to create their own new challenges. Through daily puppetry and storytelling, the children's listening skills, memory skills, and vocabulary are strengthened and they develop a deep soul connection to the human voice. In the pre-kindergarten, the stories are often nature stories, sequential stories, or simple fairy tales. In the kindergarten, more complex fairy tales are told. Through the telling of fairy tales, nature stories, and seasonal tales, the children begin to find their relationship to the world. The seeds of human evolution and our relationship to the earth and its cycles are imbedded in these stories. Fairy tales bring to life human qualities such as courage, kindness and honesty, while nature stories enhance the children's experience of the seasons and festivals of the year. 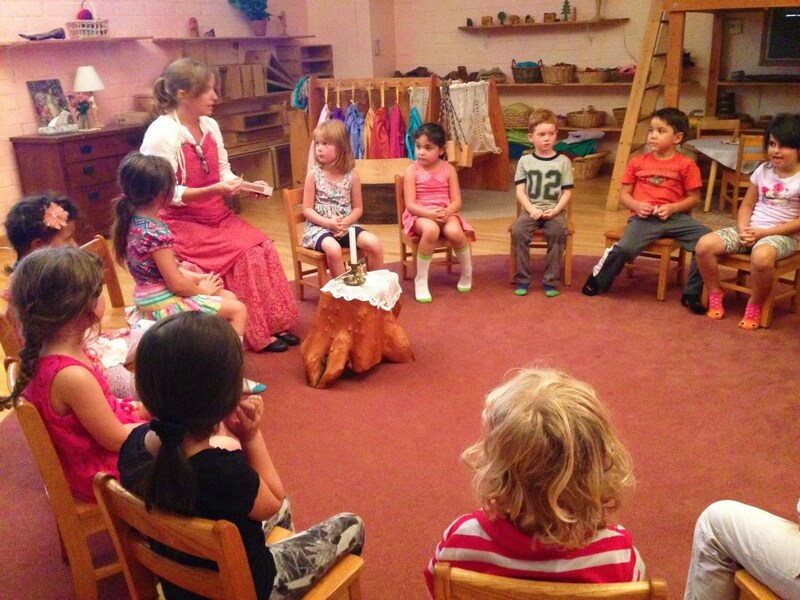 As the children develop the capacity to allow a story to penetrate them deeply and to live into the story through different experiences (spoken word, puppet-play, and playacting), the seed is planted for them to do the same with their thinking when they develop into teenagers and adults. This prepares the way for them many years from now. They are beginning to learn how to become clear thinkers, to think with depth and clarity, and to imagine and see different sides to the same story. 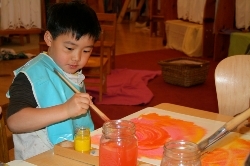 Artistic work in the early childhood program is an experience that guides young children toward abilities that can be transformed throughout life. For example, watercolor painting is accomplished with simple materials: fine paints in the three primary colors, a good paintbrush, and very good watercolor paper that has been soaked in water and gently dried. These materials allow children to experience not only the beauty of color, but also the soothing fluidity of the paint. In the kindergarten, the children sew, finger-crochet, finger-knit, mold with beeswax, and do simple craft activities that are offered seasonally. Crayon coloring and drawing are available to both kindergarten and pre-kindergarten children.